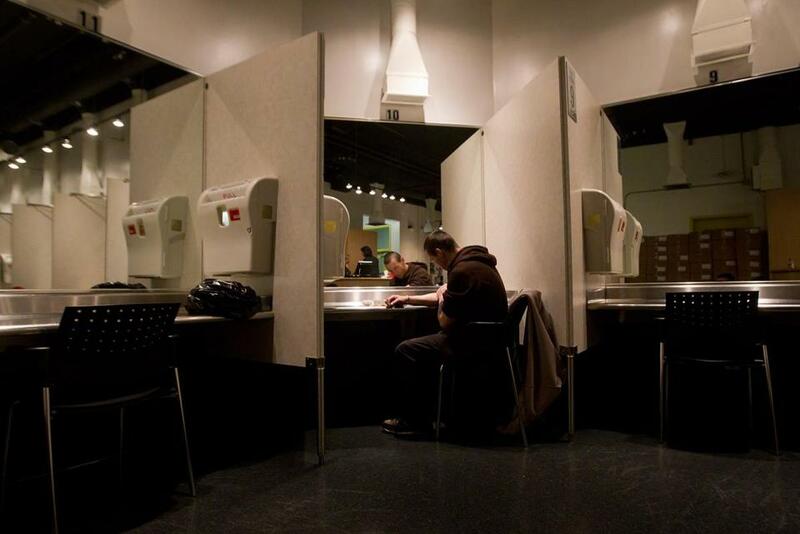 A heroin user at a safe injection clinic in Vancouver operated by Insite, North America&apos;s first legal injection site promoted by its founders as a safe, humane facility for drug users. Mayor Martin J. Walsh declared himself “very impressed” by what he witnessed during last week’s visit to so-called safe injection sites in Montreal and Toronto — but he stopped just short of endorsing the idea for Boston. Walsh and staff visited several centers where people inject illicit drugs obtained elsewhere, while being monitored by trained professionals who can rescue them from overdoses. The sites have been operating for about 18 months in those two cities in an effort to prevent overdose deaths. Walsh, originally skeptical about safe injection sites, has in recent months expressed greater openness to the idea. He was joined for part of his trip by Cambridge Mayor Marc C. McGovern, who spent two days in Montreal on a similar fact-finding mission. The commission was scheduled to report to the Legislature by Feb. 1, but McGovern said the deadline has been extended by a month. “After seeing them firsthand, it’s a completely different impression I have. . . . It’s a completely eye-opening experience,” he said. Walsh, who has been open about his own past struggle with alcoholism, added that many questions remain, including how such a center would be funded and whether it could obtain federal approval. Safe injection facilities are illegal under federal law and the US Department of Justice has made clear its intention to shut down any that open. Still, several American cities have plans to establish them anyway. Canadian federal law also prohibits the sites, but individual centers may obtain exemptions from the country’s health minister. Currently more than 100 safe injection sites operate in 66 countries. McGovern, a social worker familiar with addiction issues, said he “went into the discussion generally supportive” of safe injection sites, and in Montreal saw nothing to change his opinion. With police officials from Cambridge and Montreal on Thursday night, McGovern and his staff toured neighborhoods where the facilities operate and found no evidence of increased crime or other problems. On Friday night, McGovern and his chief of staff visited the neighborhood where an overnight facility operates, and saw nothing of concern. McGovern said he asked several local restaurant managers what they thought. Some didn’t even know there was a safe injection site in the neighborhood; others welcomed the site because it stopped people from injecting in the bathrooms or leaving needles on the street, he said. “Nobody has died in a safe injection site,” McGovern said in a phone interview Wednesday.